I don’t think of myself as a spinner. This is, as I look at the logs from last year, not true. I’m a spinner. 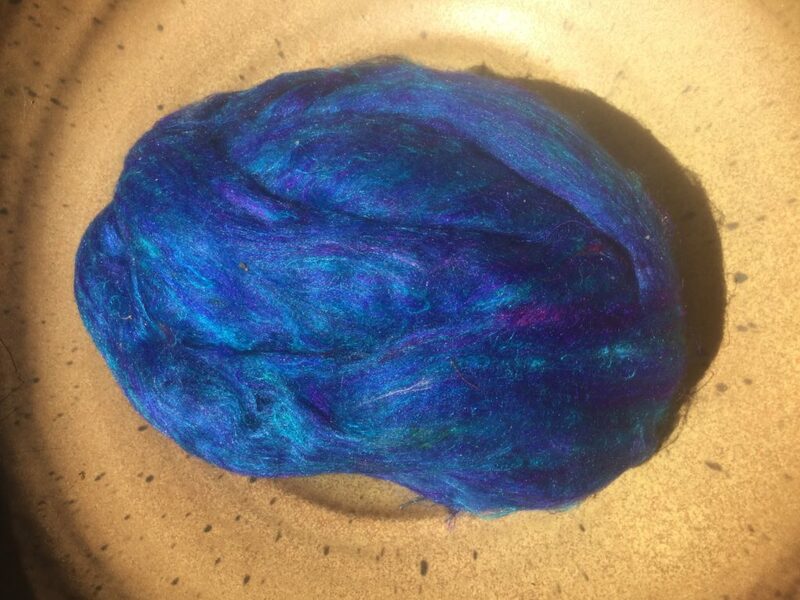 In 2017 I joined the “12 lb club” which means I spun, on average, more than a pound of yarn per month. Given that we did a fair bit of travelling (e.g. we were out of the country for two weeks in late Sept., a week in Toronto in June, etc.) that’s pretty good. Better than pretty good. The rough estimate (I think I missed some, and I know I’ve not counted the drop-spindled stuff) is ~16 lbs of spun yarn. It’s been a pretty good year for variety. A fair bit of merino*, a moderate amount of shetland, some BFL,some lopi, some alpaca, any number of silk blends, a little camel, some plain silk. 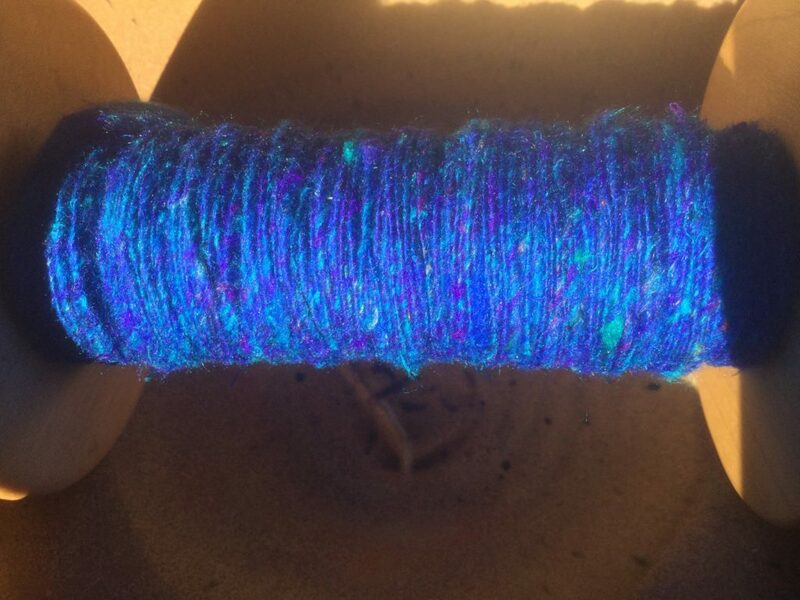 I didn’t spin much of the fibers I tend to rave about… polworth, or targhee; but this year is still young. What I did notice is my “sense of draft” has gotten much better. I noticed it yesterday when I was doing some pulled sari silk. I tried to spin some last year… it was awful; draggy, and slubby, and not at all fun. This time, well it’s still not fun, but I can spin it. It’s still slubby, but the draggy wasn’t as bad. Pulled sari is funky. It’s made by collecting the pre-production ‘waste’ from weaving saris. As a result the staple isn’t consistent. Silk is both grabby, and slippy. It’s prone to being unwilling to move, then just sliding apart. It’s really easy (at least for me) end up over-attenuated; at which point it’s really hard to ply without breaking. *It’s a really popular fiber. It’s, IMO, a little over-rated. It’s not that it’s a bad fiber, it’s that it, like anything else, is not the best for everything. It’s also misunderstood as “soft”. Merino varies a lot, from next to the skin smooth to over lingerie, to over t-shirts. Unless the spinner takes that into account when describing the yarn, it’s easy to make not quite the thing; esp if what you have is super soft, and it gets made into something which needs to be harder wearing. I like how you reveal your own inner processes, and how they interact with outer ones (like the other post on having so much yarn you’re dealing with, what managing it does to you). I suppose I could come up with a list of “You know you’re a spinner, for sure, when…” Perhaps not in this comment, though – a bit like highjacking the thread.